So far we had excellent flying here in the Nordic Open 2008 in Macedonia. Sunday the task was to zigzag in front of the east launch and then fly south, for a total of 78 km. I launched early and immediately had to struggle very low, but managed to find some bubbles and get back up. I started a bit late but the conditions were very good then and I could catch up a bit. Gradually it became clear that instead of the promised north wind we head to combat southerlies. In the final glide everybody made the same mistake to turn into the flats toward the goal too early where the headwind now was really strong, and thermals really weak. So nobody made goal. Defending champion Ronny got into the speed section cylinder of 1 km and won the day. I did 72 km for a 12th place. 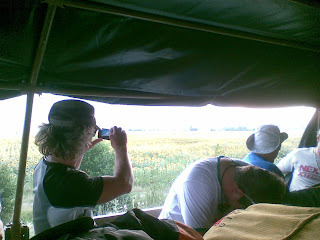 The retrieval with army trucks worked well, with a cooling wind and nice views of the gorgeous sunflower fields. Day 2 we launched from the tricky west side but most flew straight into a strong thermal. Many were quickly reaching the airspace ceiling of 3200m. The task was to fly east over the plain and then north and back with goal again into the flats, a 65km journey. This time it was not a race but scoring was on individual elapsed time. So we pilots were more spread out then usual. The thermals were strong and the cloudbase high which allow the fastest pilots to complete the task in 1:48. Ari was the fastest Finn at 1:51 for an 8th place. I got myself into trouble a few times and needed 2:30, for a 34th place. Fellow Finns Jouni, Antti, Mladen, Javis, Kasperi, Make and Kimmo also made goal and Karo and Esa did some 50 km. All the results are provisional though as many pilots violated that 3200m ceiling. The conditions were so good that several pilots flew back to launch and from there 10 km North while pulling "big ears" to stay below the ceiling. And then landed on top near a refreshing lake!